We assessed the utility of single-nucleotide polymorphisms (SNPs) and small insertion/deletion polymorphisms (InDels) as DNA markers in genetic analysis and breeding of rice. Toward this end, we surveyed SNPs and InDels in the chromosomal region containing the Piz and Piz-t rice blast resistance genes and developed PCR-based markers for typing the SNPs. Analysis of sequences from a blast-susceptible Japanese cultivar and two cultivars each containing one of these genes revealed that SNPs are abundant in the Piz and Piz-t regions (on average, one SNP every 248 bp), but the number of InDels was much lower. The dense distribution of SNPs facilitated the generation of SNP markers in the vicinity of the genes. For typing these SNPs, we used a modified allele-specific PCR method. Of the 49 candidate allele-specific markers, 33 unambiguously and reproducibly discriminated between the two alleles. We used the markers for mapping the Piz and Piz-t genes and evaluating the size of DNA segments introgressed from the Piz donor cultivar in Japanese near-isogenic lines containing Piz. 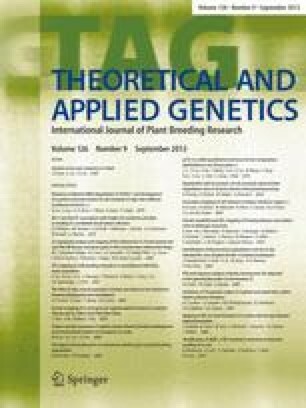 Our findings suggest that, because of its ability to generate numerous markers within a target region and its simplicity in assaying genotypes, SNP genotyping with allele-specific PCR is a valuable tool for gene mapping, map-based cloning, and marker-assisted selection in crops, especially rice. We thank T. Nakajima, N. Yasuda, and M. Noguchi for their technical advice on assaying the blast resistance of the mapping population and H. Yoshida for his advice on typing with the allele-specific PCR procedure. We also thank Y. Uehara for providing us the seeds of Hokuriku IL4. This work was supported by a grant from the Japanese Ministry of Agriculture, Forestry and Fisheries under the project name Development of DNA Marker-Aided Selection Technology for Plants and Animals.